Honington Hall was built in about 1682 by Sir Henry Parker in place of an earlier house. 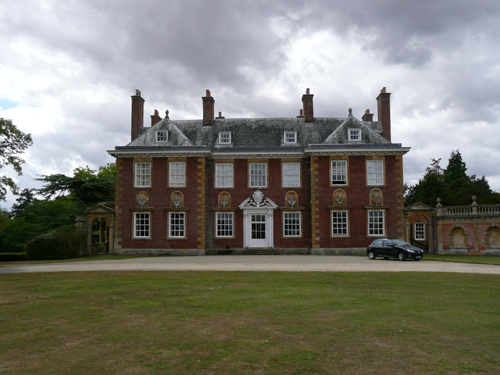 In 1737 the estate passed to the Townsend family, who made considerable alterations. 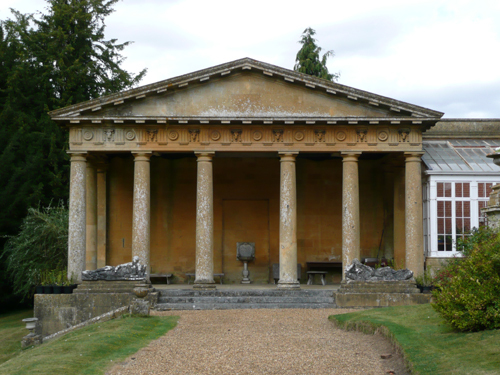 These included the erection of a great octagonal Saloon at the back: the basement of the last was retained but its colonnade was rebuilt in front of a garden house to the north-west of the Hall. The main block was of simple plan, having a central hall between side-wings which project slightly on the east front and contain the other two most important original rooms of the ground floor, the Drawing Room in the south wing with the Boudoir behind (west of) it and the Dining Room, in the north wing with the secondary staircase beside it. There seems to have been a rectangular saloon behind and of the same length as the hall. With the remodelling of ca. 1751 it was abolished and the domed octagonal Saloon, 30 ft. diameter, was built projecting from the main west front and with windows in its three outer faces. The space between it and the hall was made into a lobby with north and south two-bay colonnades that divided it from side-chambers, all between the original north and south wings. The southern side-chamber, that has its north-west corner splayed by the wall of the octagonal Saloon, contains the main staircase of this period with open iron-work balustrades. A middle doorway opens into the lobby from the hall and the same wall is also pierced with openings to the inner hall. The walls are of red brick with rusticated stone angle-dressings and stone-framed sash windows, the lower windows with bracketed drip-stones. The bracketed eaves-cornices are of wood. The entrance in the middle of the east front has side-pilasters and a curved broken pediment with a cartouche of the arms of Townsend impaled with Gore. 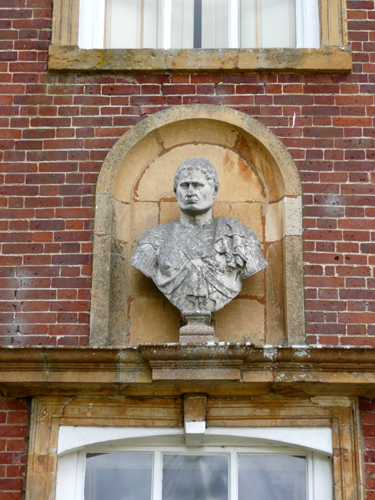 In the east and south fronts, above the ground-floor windows, is a series of ten busts of ancient Roman emperors backed by round-headed niches. Two more (displaced by the later semi-octagonal loggia on the south) can be found on the west front. The roofs are hipped and are covered with slates. In them are square-headed dormers. 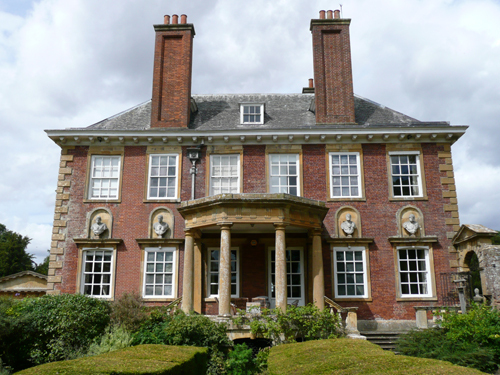 The chimney-stacks of brick are plain, except the 18th century pair on the south wall which are panelled (see below). Most of the internal decoration is of the 1751 period; including much ornamental plaster work, which has been attributed to Charles Stanley, the Anglo-Danish sculptor and plasterer, who worked in England from 1727 to 1746. Although there is no documentary proof of this, the two larger reliefs are noticeably similar to work executed by him in the Saloon at Langley Park, Norfolk. The name of John Whitehead (fl. 1748-60), who worked at Edgcote, in Northamptonshire, has also been mentioned. The Hall has six plaster bas-relief panels, with the two larger ones balancing each other at either end, flanked on both sides by scenes representing the arts. The panels over the doors are the arts of architecture, sculpture, music and painting. The subjects of the larger reliefs are “Hector saying farewell to Andromache” from the Iliad and “Venus appearing to Aeneas as he was about to stab Helen” from the Aeneid. The Boudoir also has an elaborate ceiling, the centre panel of which shows a representation of Flora; although some contend that it is of Aurora. The Drawing Room (or Oak Room), however, is lined with bolection-moulded panelling of the 1682 period, but its chimneypiece is of the later date. In the panel above the chimneypiece is an oil painting that was recently discovered behind the gilt leather panel above the door in the Chinese Closet. The plasterwork of the octagonal Saloon shows representations of the four elements and the four seasons. 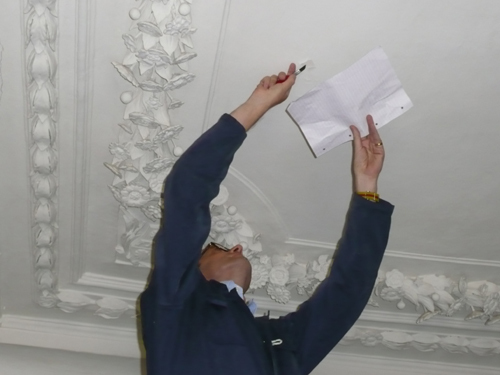 The 96 rosettes in the coffers of the ceiling are remarkable in that each one is different. The painting in the ceiling is believed to be Acis and Galatea and is attributed to Luca Giordano (1634-1705). It has been added onto, on all sides, so as to fit the Saloon frame. The Dining Room may well have been executed at a later date. The secondary staircase has heavy turned balusters and on the first landing is a wall recess for a former ‘grandfather’ clock. One small room in the south wing on the first floor has large wall panels of 18th century gilt leather depicting Chinese subjects. As a contrast to the lower ceilings, the upper ceilings are severely plain, with the exception of the Chinese Closet, which retains its late 17th century one. Taken from A History of the County of Warwick: Volume 5: Kington hundred (1949), pp. 92-95. Information also taken from the latest guidebook of the house. The house is not generally open to the public but may be visited by prior group arrangement. 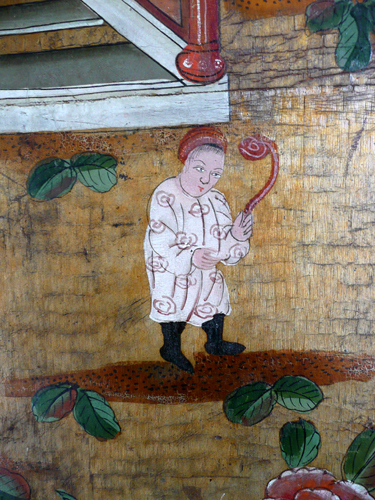 * Catalogue notes and provenance of a watercolour sold by Sotheby’s in July 2004. I am most grateful to John Harris and Lucy Inglis for bringing it to my attention. John Freeman died in 1752.